He should be suspended. This is not the 1st time. I'm sure Cardinal fans will say it was clean, hard-nosed baseball just like TLR used to say it, but this guy is going to end someone's career. I would not care if he got hit by a pitch in head tomorrow. This guy is dirt. Last night's was ridiculous. Seeing the replay, I was shocked there was no apparent structural damage to Scutaro's knee. Hope the MRI doesn't show anything. Don't know enough about Holliday's history to label him as a dirty player, but I don't know many clean players who make that play. 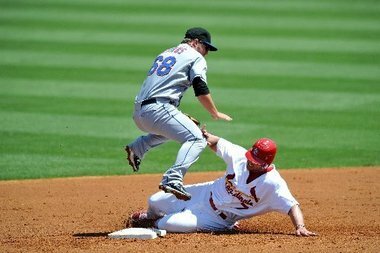 I don't know, the Cardinals tweeted that it was a "tremendous break up slide to keep the inning alive"
I wouldn't put this one with the others. 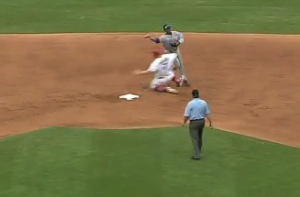 At least in this slide he actually slid BEFORE getting to the base. The other examples he either "slid" after passing the base or slid into the player several feet away from the base. 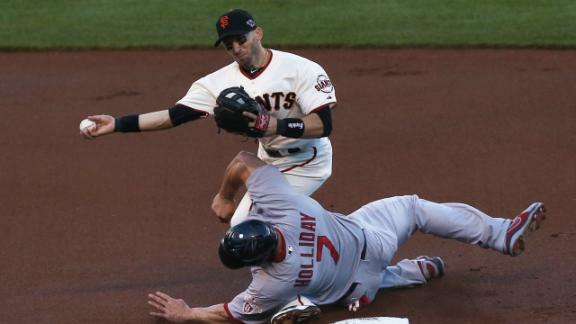 At least in this picture you can argue he's trying to get to 2nd. Last night's "slide" was a joke. He jumped over 2nd base and didn't hit the ground until he was 2 feet past it and plowing into the other player. It's called a breakup slide. If you want to end it, kick him in the face 'by accident'. Yeah, it was dirty.. I didn't like it at all.